Wow, thanks for sharing! This is so perfect for birthday parties. Ooohh... I could use those for my beer party! H-A-V-E A B-E-E-R O-N M-E !!! I'm still waiting for my invitation to your party. But you were gonna be gone! Are you still gonna be gone? Thanks for sharing this. What a great idea! These are so cute! I think that I'm going to print some out on a very small scale (1 or 2 inches), hang them on some embroidery floss or thread and make a mini banner. Thanks for sharing! I LOVED this link. Thank you so much! Thank you for sharing this with us. Very thoughtful! 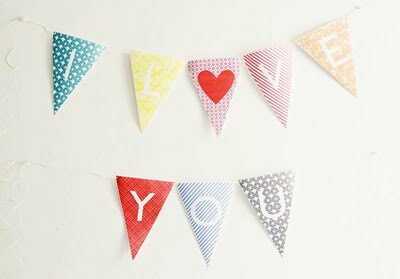 I love bunting-garlands!!! Thank you. wow! very lovely!! thanks for sharing!! Can use them for my 2nd wedd anniv this weekend! Oh no the link doesn't seem to be working anymore. Is anyone else having this problem? My friend made this for her boyfriends going away party, she ironed on pictures of him making funny faces on every 8th one. It added a cute and personal touch to the banner.